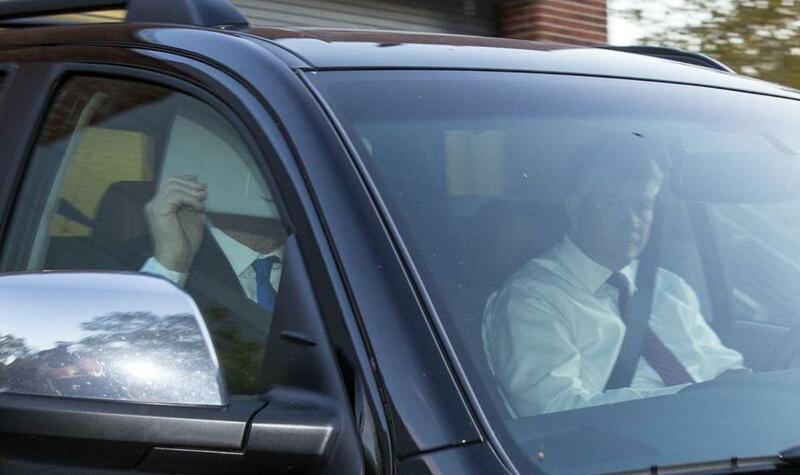 Paul Manafort covered his face as he left his home Monday. WASHINGTON (AP) — President Donald Trump moved quickly Monday to distance himself and the White House from the indictment of his former campaign chairman and another aide, saying Paul Manafort’s alleged misdeeds occurred ‘‘years ago’’ and insisting there was no collusion between the Trump campaign and Russia. Responding to news that two former senior campaign aides were charged by special counsel Robert Mueller, who is investigating interactions between Trump’s presidential campaign and Russia, the president tried to shift the focus elsewhere, asking on Twitter why Hillary Clinton and the Democrats aren’t the focus of the probe. White House Press Secretary Sarah Huckabee Sanders told reporters that the indictments have ‘‘nothing to do with the president,’’ because ‘‘most’’ of the alleged crimes occurred before they worked Trump. Sanders also dismissed former foreign policy adviser George Papadopolous — who pleaded guilty to lying to the FBI — as a ‘‘volunteer’’ on the Trump campaign and said he served on a committee that only met once. Mueller’s office announced Monday that Papadopolous pleaded guilty earlier this month to lying to FBI agents about the timing and detail of his attempts to line up meetings between Russian government officials and the Trump campaign. Sanders said Papadopolous’ actions were not sanctioned by the campaign. The three men were the first to be charged by Mueller. Manafort and Rick Gates surrendered to federal authorities Monday to face felony charges of conspiracy against the United States, acting as an unregistered foreign agent, and several other financial counts involving tens of millions of dollars routed through offshore accounts. They pleaded not guilty in federal court Monday afternoon. The indictment against Manafort and Gates alleges criminal activity through ‘‘at least 2016,’’ when the presidential campaign was in full swing. White House allies privately expressed relief that the charges against Manafort and Gates did not specifically pertain to Russia or the Trump administration. Over the weekend, Trump had taken to Twitter to allege that the ‘‘facts are pouring out’’ about links to Russia by Clinton, his former presidential opponent. ‘‘DO SOMETHING!’’ Trump urged in one of five tweets on Saturday. In his weekend tweets, Trump referenced the fact that Clinton’s presidential campaign helped fund political research into Trump that ultimately produced a dossier of allegations about his ties to Russia. He also pointed to the uranium sale, the tens of thousands of emails from Clinton’s time at the State Department that she later deleted from a private email server, and the decision by then-FBI Director Jim Comey to not bring criminal charges against Clinton for possible mishandling of classified information. On Wednesday, Republican lawmakers are scheduled to release a tax cut bill that is being pushed by the GOP lawmakers and Trump.